High strength, lightweight frames crafted from furniture-grade poly resin. Includes shorter 3” legs for use in a Crate and a second, standard height set of legs for use outside the crate. Easy to clean and guaranteed to stand up to repeated cleaning. Select your bed by matching the inside dimensions of your crate to the nearest bed size. Give your dog a lift with the orthopedic support and comfort of a patented chew proof dog bed. We add a set of shorter 3” legs to our standard dog bed to allow ample head room for the dog inside the crate. Use the standard length legs (included) when you move the bed out. We offer a wide choice of fabrics and colors to look good in any décor. Match the inside dimensions of your crate to the nearest bed size to select your bed. We do not guarantee that our crate beds will fit in every crate. 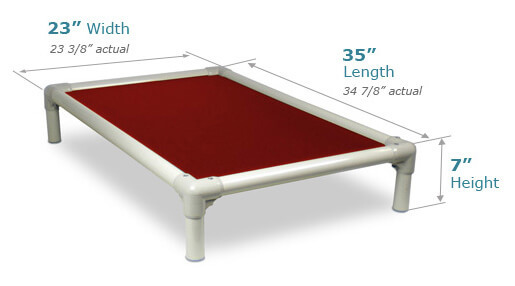 Kuranda Dog Beds® and Kuranda Pet Beds® are registered trademarks of Kuranda USA, Inc.